We all have ancient warriors in our past, and to know their history is to know ourselves. For better or worse, ancient military might has shaped our modern world. Through these early struggles peoples, religions and ideas were thrust into greatness and power or wiped from the face of earth. Ancient weapon innovations, military organization and commanders all played a critical roll in determining who controls our worlds resources and wealth. To understand ancient military history is to understand where history itself originated, and their for it is essential in understanding mankind. Ancient Military explores the early history of warfare for these reasons and because, although brutal, ancient military history is above all else, extraordinarily interesting! 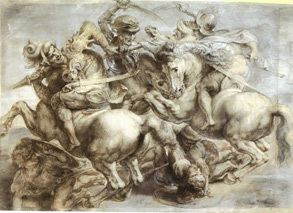 in The Battle of Anghiari, a lost painting located under another mural. Anthropologists and historians hotly debate when man first ventured into the dark realm of warfare. Our earliest ancestors certainly beat each other to death in order to protect their hunting grounds and women, but the question of when in man organized into military units and waged war is much more complex. We know that ancient weapons suchs as simple spears and clubs came into common use shortly after the dawn of man some three million years ago. Complex spears were in use 400,000 years ago and that bows first appeared on the scene around 60,000 years ago. However, cave paintings from this time period only show hunting scenes. True organized warfare took the adaptation of food production, hunter gather were simply to few to mount anything more than raids. Only with food production could the population support launching mass amounts of armed men into battle. Not that earlier man didn't engage in some organized violence, 20,000 -12,000 year old cave paintings depict battles scenes in Spain. Groups of archers fighting in rows with clearly garbed leaders in front. The first prehistoric battle in the archaeological record is on the Nile near the Egypt-Sudan border, although this claim is contentious. The site known as Cemetery 117 it is dates from approximately 13,140 to 14,340 years old. It contains 59 skeletons along with many partial skeletons, many with arrowheads or spear points embedded in them, indicating that they may have been the battle casualties. On a 7,500 year old site called the Talheim Death Pit, archaeologists believe a rival tribe was massacred. Approximately 34 people were bound and predominantly killed by a blow to the left temple. The site in Germany is one of the earliest indications of warfare in Neolithic Europe. By the 4th millennium BC the agricultural revolution had developed to the point where small cities developed in Mesopotamia. Now the ball could get rolling. Military conquests expanded city states into empires begin in the 3rd millennium BC. Sargon I creating the first empire (Akkadian Empire) and pioneered combined arms tactics using archers, donkey chariots and spear armed infantry units. The Pharaoh Senusret I in the 20th century BC conquered Nubia and placed it under Egyptian control. Babylonia and later the brutally efficient Assyrians built empires in Mesopotamia. While the Hittite Empire ruled much of Anatolia and the Pharaohs ruled the Nile delta. Chariots first appeared on the Eurasian steppes in the 20th century BC, and become central to warfare in the ancient Near East after massive invasions of Chariot using tribes slammed into the settled river valley civilizations. The Aryan, Kassite and Hyksos conquered and ruled the once proud civilizations. The Hyksos took control of the Nile Delta, ruling for several hundred years until the ancient Egyptian military, lead by a Prince who still ruled the middle section of the Nile Valley defeated them using their own Chariot tactics against them. and so was ancient military history. 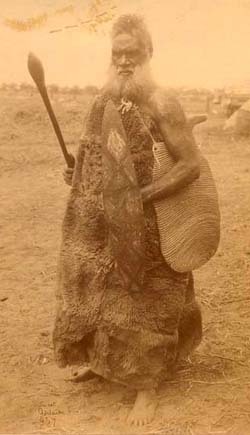 This tribal warrior is well protected with his hard wood shield and hide armor plus he's ready to bash a skull with his war club. Tribal warfare became more advanced after the discovery of agriculture and animal husbandry. Village populations could now support the manpower needed to conduct warfare on a large scale. Stay up to date on the latest information about ancient military history, weapons and warriors! Copyright © 2016 AncientMilitaryHistory.com All rights reserved.